/ Enable Microphone for an iPhone App? Enable Microphone for an iPhone App? Just downloaded a guitar tuning app and it totally doesn’t work at all. 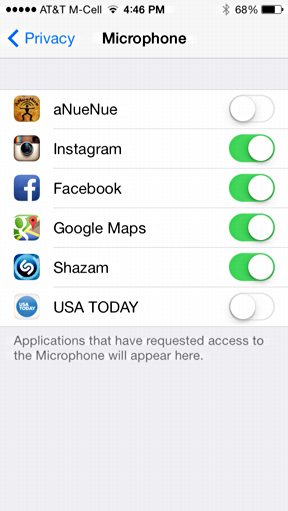 Do I need to allow it to access the microphone on my iPhone 5 or enable mic access? You are exactly right in your supposition, though either it’s a poorly written app or you were moving a bit too fast when you first launched the program. Why? 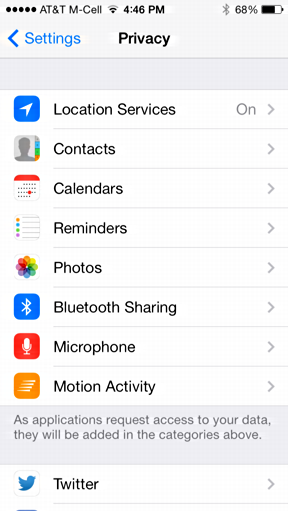 Because apps that request access to the microphone on your iPhone (or iPad, or iPod Touch) should pop up a dialog box indicating that it needs access and requesting permission. My guess is that when you first launched the guitar tuner app it did just that but you interpreted it to mean something else and said “no”. Making it rather dead weight on your iPhone, for sure. A tuning app that can’t actually “hear” the note your playing is not useful at all! 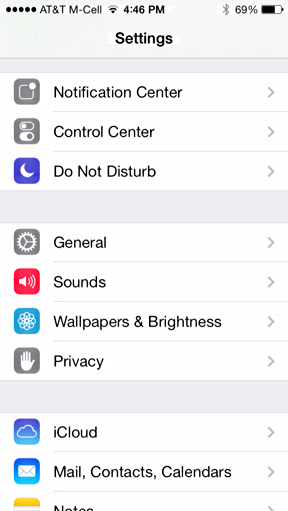 You need to go into “Privacy” to find what you seek, so tap on “Privacy”. Hey! There it is: “Microphone”. With the red icon. Note the other capabilities of the phone here too, including motion activity. Lots to pay attention to if you want to lock down your privacy with the device. For now, however, tap on “Microphone”. Here you can see that I have six apps on my own iOS 7 iPhone 5s that request access to the device microphone, and only four have been granted permission. I mean, why does USA TODAY need to get to my microphone? My daughter has a new ukelele, however, so we grabbed a tuning app called aNueNue and, just as with your guitar tuning app, this one’s completely useless as long as I prevent it from accessing the mic to hear the note played. I’m still not too sure about USA TODAY, but otherwise, I now have to wrap up because I have an ukelele to tune! When your Facebook messenger I try to make a call ask for permission to use the microphone I K it opens up the Settings I’ve tried going to the privacy opening up the microphone and a message is there that says applications that require microphone you swell up here here i’m confused how do you turn the microphone on? How to use iPhone microphone with Bluetooth headphones? I have tried this but one of my apps called “Sing!” Is not showing up and I can’t do any songs because the app doesn’t show up were the apps that need the microphone r supposed to show up. I know me too and I don’t know how to request cause when I go to privacy, then go to camera I don’t see the switch button for any apps. Great, just to the point with pictures. I love it. do you know how to allow the use of microphone for a website (on iphone)? Short, sweet, to-the-point and with pictures! THANK YOU! Im needing to turn on microphone for an app but the app does not show up under privacy/microphone, please help. If I go into Facebook Messenger settings, the microphone option isn’t even shown. So, since switching from an Android (where I made lots of FB Messenger calls) to the new iPhone, I’ve not been able to use this feature. Each time I try to use it, it tells me to enable microphone access but won’t let me change anything or give me the option to. Any ideas? I have tried this but I don’t even have apps there. I have several apps that doesn’t have access to microphone – Skype included – but I have no option under privacy, microphone to allow them access.